Nowadays, electronic and information technology develop fast and the new electronic products update soon. Android phones and tablets, such as Samsung Galaxy S8, Motorola Moto Z, Sony Xperia XZ, Google Pixel C, The Huawei MediaPad M3,etc. are more and more popular among consumers. These Android devices are excellent choices for watching movies on the go. However, neither Android phones nor tablets have the DVD drive for playing DVD movies. That is to say, if you want to enjoy DVD movies on your Android Phones or tablets, you need to rip DVD to Android compatible video formats first. Therefore, a DVD to Android ripper is extremely needed. There are a variety of free DVD rippers for Android online and it is impractical to try every DVD to Android ripper one by one, which is a waste of time. So here we would like to provide two DVD to Android rippers for you to free rip DVD to Android tablet and phone. Pavtube Free DVDAid is a free DVD ripper to rip DVD to Android compatible video formats without watermark, such as MKV, AVI, MOV, WMV and more video formats without any quality loss. It also supports importing DVD VIDEO_TS folder, ISO files, and IFO files into this freeware. This DVD ripper can largely accelerate DVD ripping speed from one format to another by using H.264 codec by fully taking advantage of NVIDIA CUDA technology and AMD Accelerated Parallel Processing (APP). Without extra payment, you are allowed to set video/audio codec, video display ratio, bitrate, frame rate and more to extend great DVD experience at home or on the move. What’s more, with powerful video editing functions included, you could achieve the best video and audio quality for DVD movie entertainment. Learn the equivalent Mac version>> Pavtube Free DVDAid for Mac. How to free rip DVD to Android Tablet and Phone with Free DVDAid? Step 1: Install and lauch the DVD to Android converter. Click the "Load DVD" button on the top left to add the DVD movie file to the free ripper. ISO and IFO files are also supported. 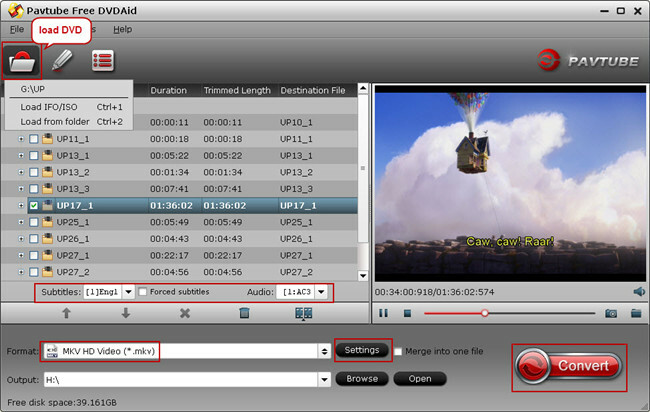 After the DVD files are loaded, you can preview the imported DVD movie by double clicking the title and click the play button under the right viewing window. By clicking the camera button under the preview window, you can take snapshot of your favorite movie scene for other use. Note: You are allowed to preserve the forced subtitles in DVD movie, click “Subtitles” dropdown menu, choose your first language(e.g. English), then check the box “Forced subtitles” nearby, and then enjoy DVD with forced subtitles. You can also extract your required subtitles as .srt external subs to do other use. What’s more, for getting a better visual experience, you can also click the Edit icon on the tool bar of main interface to open "Video Editor" window to edit video at will, such as trim, crop, text watermark, image/video watermark, effect, audio editor, and subtitle. Step 2: Hit on the Format bar and you can choose any Android friendly formats, e.g. MKV, AVI, MOV, WMV for output. Hit "Browse" button to choose the folder you want to save your output video. If you think the video size is not suitable for your Android phone and tablets, you can first choose any one of the provided video formats, and then adjust the video settings. Just click the “Settings” button to customize output video quality like resolution, frame rate, bit rate, audio channel, etc. Generally speaking, the higher video bit rate will results in the larger output file size, and vice versa. Step 3: When all the settings are done, click the red button "Convert" to start free ripping DVD movies for playback on Android tablet/phone at ease. After that, you can connect your Android phone or tablet to computer via a USB device and transfer the videos to your Android device for enjoyment on the go. Tips: If you desire to watch favorite DVD videos on iPhone 7, iPhone 7 Plus, you can rip DVD to MOV format, which is a compatible video format with Apple products. Pavtube Free DVDAid can meet your basic needs when rip DVD to some Android compatible video formats including MKV, AVI, MOV, WMV,.etc, however, if you want to rip DVD to 3D, 4K and H.265 MP4 formats, you may need the help of Pavtube DVDAid. Click here to learn more difference between Free DVDAid and DVDAid. 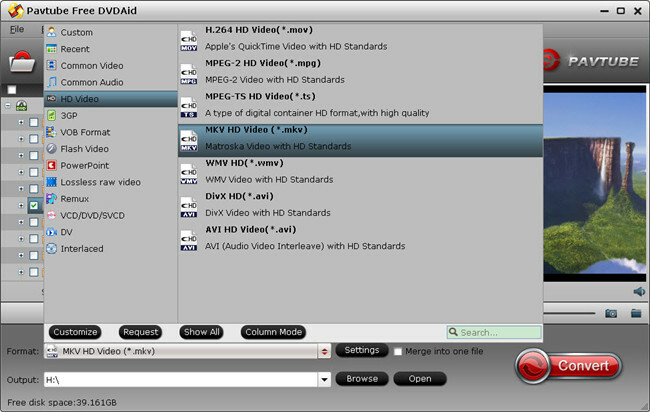 Handbrake can free rip DVD to MKV and MP4 videos with H.264, MPEG-4, MPEG-2 codecs. This open-source DVD ripper is free, and available for Windows, Mac, and Linux. You can rip DVD with Handbrake easily, but it’s limited to non-protected DVDs, which means removal of copy protection from DVDs is not supported, so you need to install libdvdcss, an open-source library that can remove the CSS (Content Scramble System ) and some region codes from DVDs. However, these DVDs you bought from store contain various encryption, not just CSS. If your DVD isn’t protected, handbrake is right your best DVD to Android ripper. Want DVD to Android converter for Mac>> Handbrake for Mac. Step 1: Install and launch HandBrake, click on the icon "Source". Specifically, there are three options listed: Video File, Folder and DVD Drive Option. 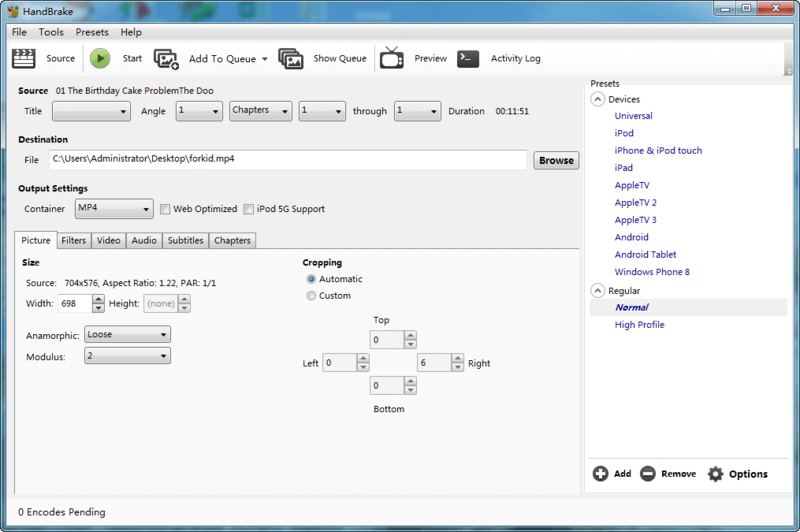 In order to employ Handbrake to convert DVD to Android friendly video formats, you can insert the DVD into your DVD drive and simply choose the DVD you prepare to convert from the drop down menu. Step 2: Hit the Title drop-down menu at the upper left-hand corner. For non-commercial DVDs, Handbrake will select the main title for your source by default. Personally, if you want to rip the entire movie, the track with the longest duration is usually the one you want to choose. Then go to the "Container" to choose MKV or MP4 as output format. Of course, you can also choose the preset "Android" it provides for you. Click the "Browse" button under "Destination" button to choose the path where you want to save the output file in. Then Click "Save". Step 3: Once you finish all settings, hit the "Start" button on the left top to start DVD to Android Tablet and Phone free conversion with Handbrake DVD ripper. After conversion, a window saying that your Handbrake queue is done will appears. Conclusion: If you are intend to rip commercial DVD disc to common digital file formats for Android device playback, Pavtube Free DVDAid is absolutely your best choice because it not only can rip unprotected DVD, but also commercial DVD to Android phones and tablets. As a video editor, it is also shows a better performace as you see in the chart. Besides to DVD decryption ability and video editing function, Pavtube Free DVDAid even supports more multiple video formats than Handbrake. Pavtube Free DVDAid can become your best assistant to free rip DVD to Android phones and tablets.